With 300 recipes and 100 photographs, this book gives home cooks recipes for busy nights, vegan recipes and recipes that are a bit more impressive and also take a bit more time. The book is divided differently than most, with a type of recipe, such as salad, and then a recipe three different ways for it. There are 100 different categories to choose from. Whether its Pasta with Cream Sauce, Savory Breakfast, Teriyaki or Indian Curry, there are all kinds of categories to page through and decide what you feel like cooking for the day. An example of the variety in categories is Quesadillas: the easy recipe is Chicken Quesadillas, the vegan recipe is Sweet Potato Quesadillas with Pepita Salsa and the company recipe is Chorizo Quesadillas Verdes with Pepita Salsa. There is also categories like Sunday Dinner, which has Roast Chicken for the week as its easy recipe, Butternut Wellington as its vegan recipe and Prime Rib with Popovers and Marrow au Jus for its company dinner. As well, there is a Thanksgiving category, which has Roast Turkey Legs with Cracker Stuffing and Lemon-Sage Butter as its easy recipe, Autumn Galette with Brussels Sprouts and Chestnut Cream as its vegan recipe and Dry-Brined Turkey with Oyster-Cornbread Stuffing and Gravy for its company recipe. Most of the recipes are fairly uncomplicated for an experienced home cook, and the easy ones are easy enough that inexperienced cooks can follow along. I found most of the ingredients were probably easily found locally, that is unless your grocery store is going through a confusing and annoying remodeling. 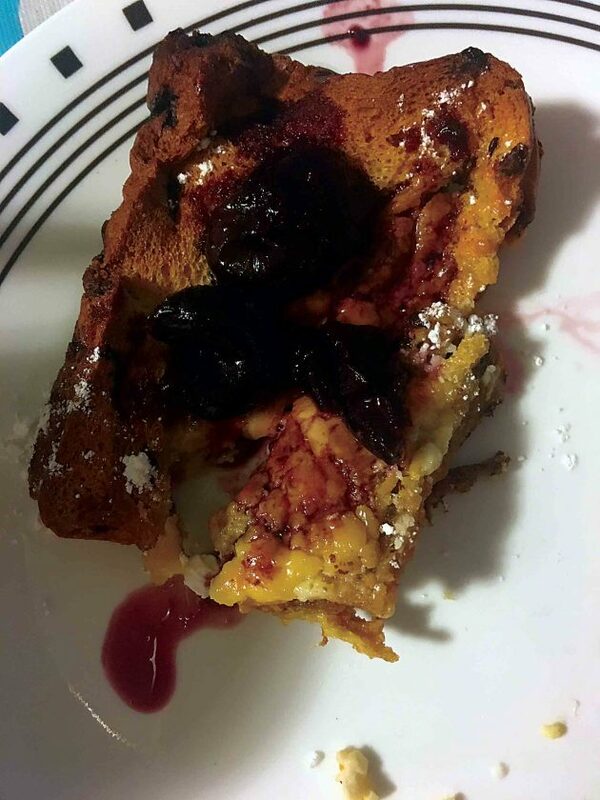 I decided to try one of the company recipes one evening for dinner – Baked Mascarpone French Toast with Cherries. It really wasn’t a complicated dish at all. I had to get challah and oven dry it, which the recipe had a handy note as to how to do that, let the bread soak in eggs overnight, and then the next day, put the whole thing in the oven to cook and make the cherry sauce. The sauce uses frozen cherries, and just cooks on the stovetop, and worked easily. When I went to find bread (pre-the horrific remodel) there was no challah available, so I ended up buying brioche that had chocolate chips in it. I thought it added a nice addition to the flavor, as chocolate-covered cherries is a favorite for a lot of people. Everyone enjoyed the “french toast” which was a bit more like a bread pudding to me, and the sauce was pretty good with it, though you could have probably also just used maple syrup with it too and it still be pretty good. Overall, I was satisfied with how the recipe turned out and I’d try something else from the book!